The drive home on Friday afternoons is always glazed and unfocused. Some where at the end of the week during the hours of 3 or 4, my brain just shuts off. I left school feeling a bit sick, tired, sore throat, spacey. So when I got home all I wanted was to sit on the couch and eat soup. 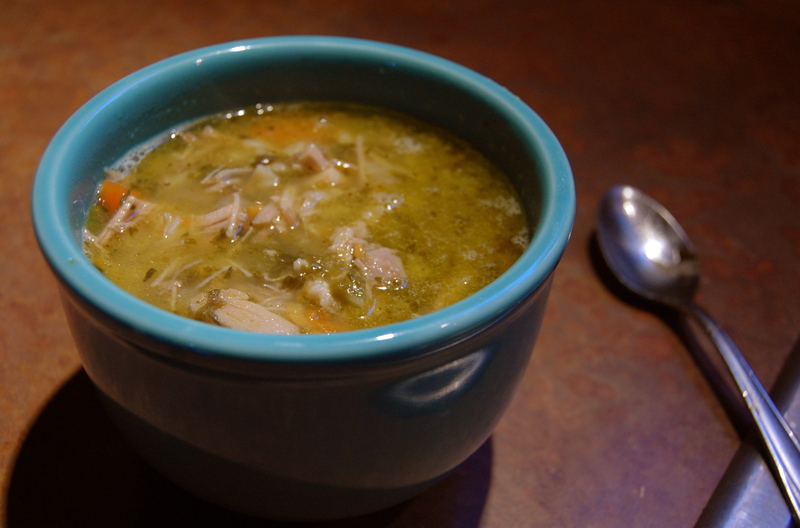 So I present to you Turkey Barley Soup, the answer to the Friday Afternoon Blahs. Barley is a great grain to use while dealing with PCOS, it is low on the gycemic index and can actually help with insulin resistance. 1. Heat oil in dutch oven or large pot. Add onions, carrots and celery and cook until softened. 2. Add turkey to vegetables. Then add broth and water. Heat to a simmer. 3. Add barley, greens, bay leaf, spices and salt to taste. 4. Cook at a simmer for half and hour.